If this skirt looks familiar to you, there's maybe a few reasons for that. 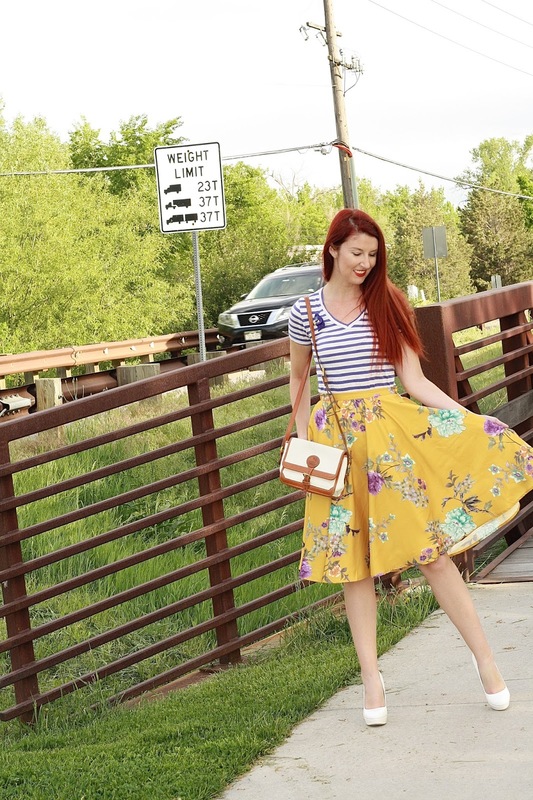 For one, it's been on ModCloth for give or take...roughly forever (until it's recent sell out...#sad), so if you've ever browsed that site, you may have seen this popular skirt. I also featured this skirt earlier this winter on the blog! I got this skirt at the end of 2015 and I love it so much that I've decided to feature it every season for the next year to show off how versatile it is. I decided to go with a floral song name to call this blog post, and I landed on an Our Lady Peace song, "Automatic Flowers." Though I claim to be good at music trivia and such, I actually have no idea what happened to those guys! Seriously, does anyone know if they are still around? They're something of a forgotten band in my immense musical memory, but the second I do hear them so many memories of 8th grade come rushing back to me and I recall that they were one of my favorites as an early teen. 8th grade kind of sucked though, so maybe that's why I block them out?? Anyway, I listened to their Clumsy album (where "Automatic Flowers" is from) recently and while I find the sound to be ever so slightly dated, I did enjoy it and don't feel embarrassed by liking them! Here they are! REALLY digging the florals and stripes! So true! 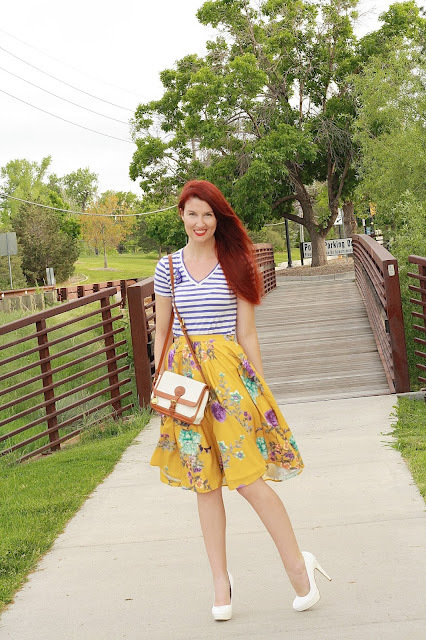 Florals and stripes go so well together! This skirt is abdolitely darling. You're right too about it being on Modcloth forever. It was on my wishlist for the longest time and for whatever reason, I never bought it. Im kind of sad now that its sold out! Anyway, Im really digging that bag too and these white heels. White shoes go with just about everything haha. Have a great holiday weekend! I love how you mixed stripes and florals! They go together perfectly! I've been kicking myself for not ordering that skirt (now that it's sold out, I NEED it)! It's so pretty and definitely versatile! I hope you have a great weekend, Lauren! Beautiful as always.. I love the contrast of your red hair and your yellow skirt.. Gorgeous!! Terrific outfit! You're tempting me to mix stripes and florals far more often than I presently do (and that isn't a bad thing at all! :)). Love everything about this look! Especially the white shoes! Love the stripes with the skirt! Amazing! I have considered getting this skirt forever, but I always end up thinking I won't be able to style it as well as the ladies that have it already. I LOVE Our Lady Peace's song Innocent (hahaha how mainstream of me :p)Your brooch sounds freakin' cool and that bag :O um yes please! You look so lovely! I adore your bright and vibrant skirt! I love how you combined your prints , that skirt is so pretty . Such a fun and beautiful outfit! I'm loving the skirt and stripes combo! You look great. What a gorgeous skirt! Loving it with the stripes and your white heels. One of my favorite outfits of yours! Stunning as usual! I love the stripes and florals combo, and the brooch sounds so fun! Hope you're having a good long weekend! 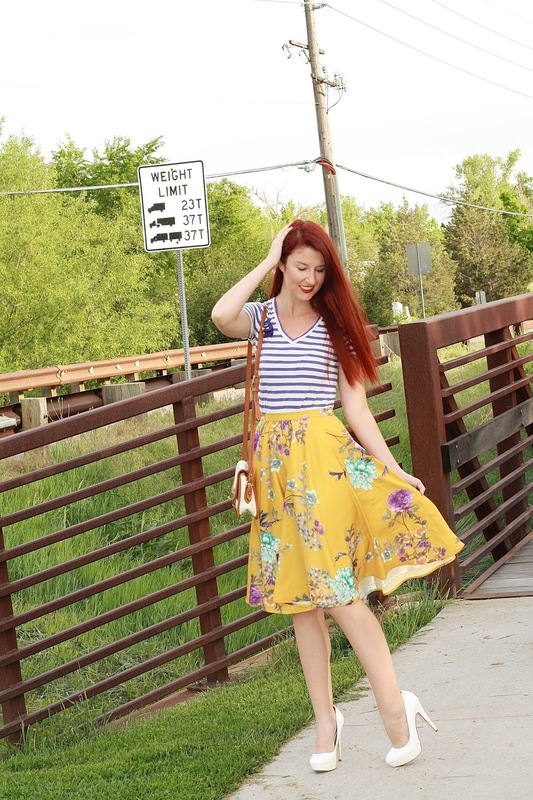 Love your print mixing and love how flowy this skirt looks on you! Gorgeous Lauren! I'm late to the game but Our Lady Peace is still together lol. They are not doing too well though.